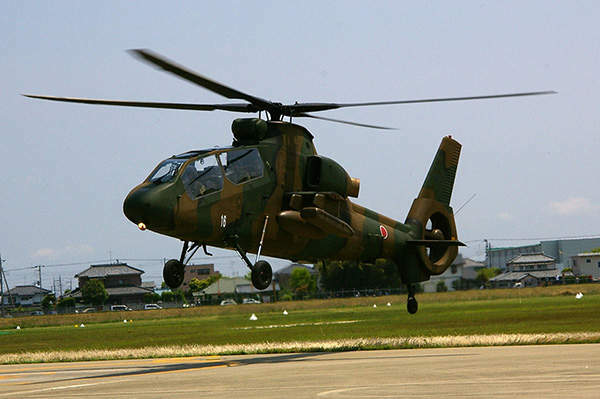 The OH-1 is a light observation helicopter operated by the Japan Ground Self-Defence Force (JGSDF). A close starboard view of the OH-1 light observation helicopter. Image courtesy of Weasel. A Kawasaki OH-1 observation helicopter of the JGSDF stationed at Matsushima Air Base. The OH-1 light observation helicopter can fly at a maximum altitude of 16,010ft. Image Courtesy of Miya.m. An OH-1 helicopter on display at Camp Kasumigaura of the Japan Ground Self-Defence Force (JGSDF). 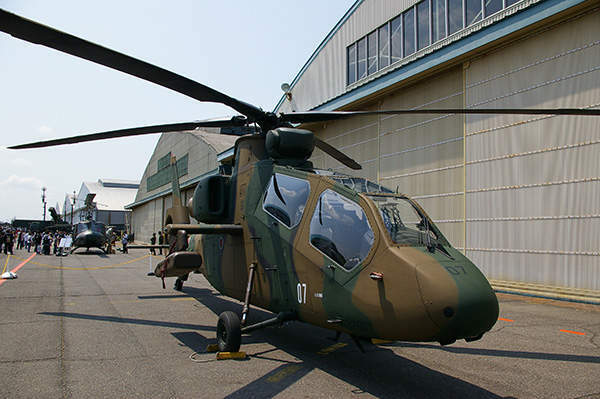 The OH-1 is a light observation helicopter produced by Kawasaki Heavy Industries for the Japan Ground Self-Defence Force (JGSDF). 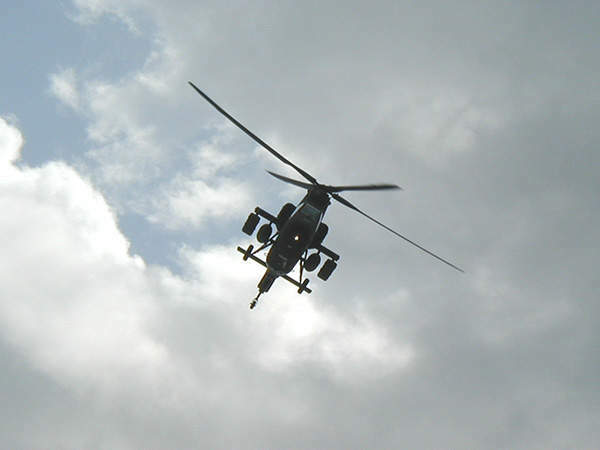 The helicopter is a successor to the OH-6D helicopter of the JGSDF. The OH-1 is also referred to as the Ninja. "About 34 OH-1s had entered service with the JGSDF by March 2012." The OH-1 is Japan’s first indigenously built helicopter. The first prototype OH-1 completed its maiden flight in August 1996. Kawasaki handed over a total of four prototypes to the Japan Ministry of Defence by August 1997. 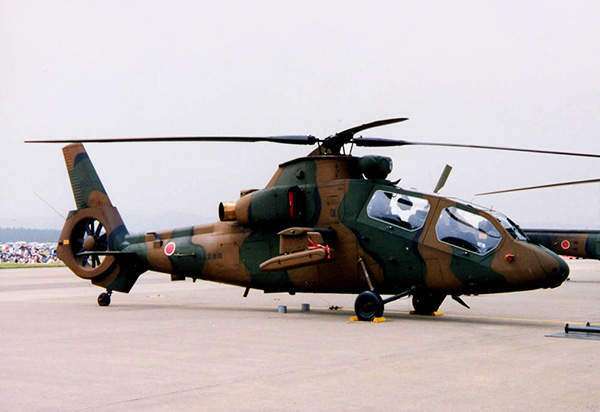 The first production OH-1 was delivered to the JGSDF in January 2000. 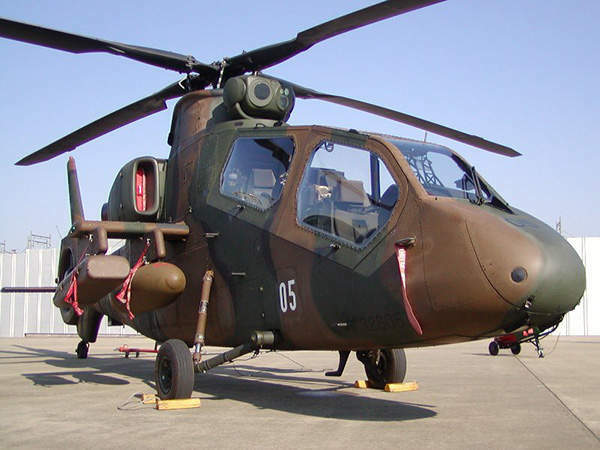 The JGSDF had planned to acquire 180 to 200 OH-1 helicopters, but the purchases were affected by defence budget cuts. About 34 OH-1s had entered service with the JGSDF by March 2012. 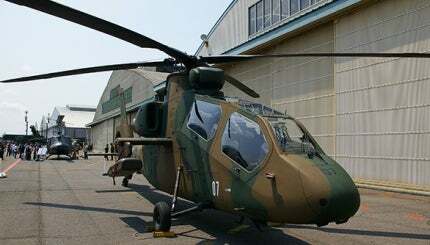 The JGSDF initiated its plans to acquire a new indigenous observation helicopter to replace its Kawasaki license-built OH-6Ds in the 1980s, which became known as the OH-X programme. Design proposals for the OH-X programme were presented by Kawasaki, Fuji and Mitsubishi. Kawasaki’s design was selected on 18 September 1992. Boeing AH-6i is a light attack / reconnaissance helicopter designed primarily for export markets. The Japan Ministry of Defence allocated $22.5m in FY92 for the basic design phase of a new helicopter under the OH-X programme. The request for proposals (RFPs) was issued in April 1992. Kawasaki was preferred as the prime contractor (60% of programme) in September 1992, along with Fuji (20%) and Mitsubishi (20%) as sub-contractors. The preliminary design phase commenced in October 1992 by the Observation Helicopter Engineering Team (OHCET) established by three companies. The helicopter made its public debut in September 1994. It received the designation of OH-1 in late 1996. The OH-1 incorporates a slender fuselage made of composite materials. The engines are mounted either side of the fuselage, well behind the tandem cockpits. The composite joint-free rotor hub includes a four-bladed main rotor made of composite fibreglass. The tail rotor is shrouded in Fenestron assembly to reduce noise and improve safety. The helicopter has a length of 13.4m and height of 3.8m. The diameter of the main rotor is 11.6m. The maximum take-off weight of the OH-1 is 4,000kg. The helicopter accommodates two crew in tandem configuration. The front and rear cockpits house a pilot and a weapons officer/observer. Access is provided through upward-opening on the starboard side. The bullet-proof glass on the cockpit provides all-round visibility for the crew. The cockpits are equipped with armour protection and shock-absorbing seats to enhance crew safety. "The OH-1 can fly at a maximum speed of 270km/hr." The pilot cockpit is equipped with multi-function LCD displays, a head-up display (HUD), dual Hands on Collective and Stick (HOCAS) controls and an auto-pilot system. The roof-mounted electro-optical sensor turret houses a Fujitsu forward looking infrared (FLIR), a colour TV camera, a laser range-finder and target designator. The wing stub assemblies on either side of the fuselage house four hard-points carrying external stores of 132kg. The hard-points can be armed with a wide range of weapons including a combination of missiles, rocket pods, cannon pods and gun pods. The inner pylons can carry external fuel tanks for extended range. The OH-1 is powered by two Mitsubishi TS1-M-10 turboshaft engines. Each engine generates a power output of 884shp. The Full Authority Digital Electronics Control (FADEC) system controls the engines. The non-retractable landing gear of OH-1 includes two main landing gear units extending from forward fuselage and one unit under tail rotor assembly. Each unit is fitted with a single wheel. The OH-1 can fly at a maximum speed of 270km/hr. It has a cruising speed of 220km/hr. The service ceiling of the helicopter is 16,010ft. The helicopter has a maximum ferry range of 550km. The A109M light, twin-engine multipurpose helicopter has been developed by AgustaWestland in Italy. The Mi-171Sh helicopter is being produced by the Ulan-Ude Aviation Plant (UUAP), part of Russian Helicopters.